Man, that Judgment Day sure was a bummer. Let’s get a Slurpee. 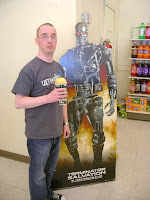 To kick start today’s marathon of all four Terminator movies -- a little something we’re calling Terminatorthon -- we went to 7-Eleven to try the new Apocalyptic Ice Slurpee. But according to Slurpee Nation, Apocalyptic Ice is more than a refreshing treat. Whoa. That’s a lot of pressure. I mean, how many of these Slurpees do I have to drink before Skynet goes ka-plooey? Is a Terminator going to get me if I’m momentarily sidelined by a cold headache? Instead of tasting like nuclear desolation, Apocalyptic Ice actually tastes kind of like Ecto Cooler used to, back when you could still get it anyway. Hey, maybe we should try shorting out Skynet via a good old-fashioned sliming. Scratch that. Bad idea. I’m iffy on the effects of getting slimed by Slimer, but it seems like that could have the potential to imbue the Terminators with the arcane supernatural powers of the dead whose souls have been cursed to wander the earth. And that just sounds like nothing but trouble. Wait -- hold up again. The 7-11 website is selling a different story about Apocalyptic Ice. So now I’m a robot sleeper agent? But I don’t want to be a Terminator! I’m so confused. As if I wasn’t already having a hard enough time getting my head around why John Connor and Bruce Wayne look so much alike. Is Batman like John Connor’s uncle? Are they brothers or something? Clearly, the smartest thing we can do is travel back in time and prevent the Apocalyptic Ice Slurpee from ever being created. Secondary mission: Stockpile Ecto Cooler. That stuff was so good. We take back everything we said about the KFC Famous Bowl. Did you know Grindhouse is criminally unavailable on DVD in its original double feature cut with all the fake trailers and mock concessions ads and everything? Well, that’s the truth. But Starz ran it a few weeks back and Robert DVRed it so we could check it out a second time, having been lucky enough to catch Grindhouse during its theatrical run. And this time we could enjoy a few quarts of Miller High Life while watching without having to sneak our beers into the theater by hiding them in a shoebox. 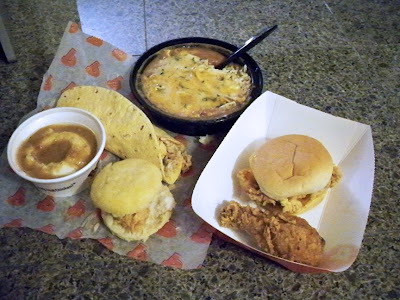 Because cheapo B movies deserve a ton of greasy food, we hit up Popeyes Chicken & Biscuits for dinner. Robert was intrigued by the new Popeyes $4You deal, where for $4 you get to pick three items off the value menu, and I felt practically obligated to try the new Chicken Bowl. You are correct -- this story does not end pretty. For my $4You picks, I got a Loaded Chicken Wrap, Chicken Biscuit and a side of mashed potatoes. Robert got a Delta Mini, Loaded Chicken Wrap and a spicy drumstick. Plus, because they accidentally made a Chicken Biscuit before making his Delta Mini, he scored a Chicken Biscuit for free. Keeping in mind that you’re paying $1.33 per item, out of the nine options in the $4You line-up, there are only a few actually worth picking. Let’s review. 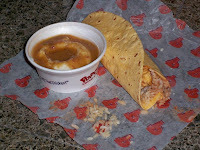 Loaded Chicken Wrap: This is your best bet -- a tortilla stuffed with a chicken tender, cheese, and red beans and rice. 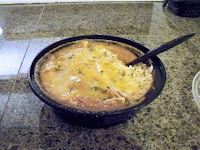 Oddly enough, it's got more or less the same ingredients as the Chicken Bowl, yet is much more appealing. Delta Mini: Also decent. 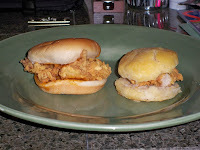 A chicken tender on a small bun slathered with Delta Sauce, which is some kind of spicy mayo. Robert split his with me, and I wish I’d got my own. Chicken Biscuit: Exactly what its name says -- a chicken tender on a biscuit. Good in theory. Disappointing in execution. Somehow managed to be dry and greasy at the same time. Neither of us finished ours. Says online you’re supposed to get a choice of Louisiana hot sauce or honey, although no such offer was made this evening. Biscuit: Because you could get a biscuit with a piece of chicken in it instead, you should pick this only if you are new to the planet and have no concept of value. Leg or Thigh, Mild or Spicy: Like the KFC Big Box Meal, it’s not enough bone-in chicken to make a true impression. Three Louisiana Nuggets: Really, Popeyes? Three whole nuggets? You spoil us. Nets out to 44¢ a pop. Regular Side: Should you want some red beans and rice, mashed potatoes and gravy, Cajun fries or Cajun rice, this is a decent option. For the suckers out there, Popeyes also offers cole slaw. Always thought it was weird that Popeyes doesn’t serve spinach, but it turns out the chain is actually named for Jimmy “Popeye” Doyle of The French Connection, rather than the sailor man. Regular Drink: I’m sick of sodas being offered as a value menu item. A waste of one of your three picks -- especially when you’ve got a few Miller High Life quarts waiting for you. Popeyes, take note -- a value menu with little value is not a value menu at all. Maybe you should just stick to what you do best, as your chicken speaks for itself and your sides have always been strong. Whenever I want fast food fried chicken, the second thing I do is figure out where the closest Popeyes is. The first thing I do is admit to myself I’m not going to accomplish much the rest of the day. As for Grindhouse, the second time around it was still wicked cool. Planet Terror: Comically super-violent, bloody and extra awesome. Death Proof: A bit talky, but the scene that shows four different points of view of Stuntman Mike mowing down a carload of girls with his Chevy Nova is totally sweet. What we should’ve done is hunt down some authentic movie theater nachos. We’re talking the kind where the cheese comes out of a vat, not the kind with the microwaved cup of cheese. Now that’s what a B movie double feature tastes like. *Full disclosure: While Popeyes’ Chicken Bowl recipe and presentation clearly wasn’t developed to allow for a moderate amount of travel time, we did endure a snafu that could potentially qualify as extenuating circumstances and intensified the Chicken Bowl’s rapid congealment. Since Robert’s wife Kelly wasn’t in the mood for either Grindhouse or Popeyes, we had to stop at McDonald’s to pick up dinner and a movie for her. There were six or seven people in line for the Redbox -- longer than the actual line for food. I understand that standing in line is the social cost of getting a new release for $1 -- but honestly people, can we work together on this? Have a list ready of three to four movies that you’re looking for when you arrive. If they’re all rented out, pause on the side to regroup and let the next person go. Do not stand there and look at every single movie description while a long and impatient line of people amasses behind you. At least three Redbox customers did exactly that, and it was more than 15 minutes before we could get Kelly’s movie. Look, T-Ball kid at the front of the line taking forever -- Delgo isn’t out on DVD yet, so step off. I think I saw Jim Messina in the alley. 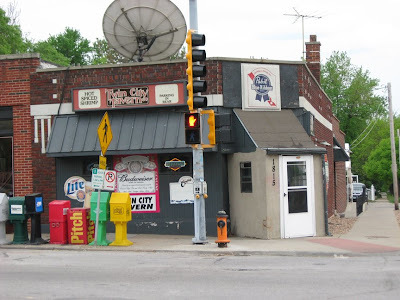 Soon as I saw that on the Twin City Tavern sign, I knew that’s where we should eat before going to Record Bar to see Summer Breeze, Kansas City’s soft rock tribute supergroup. Not that I had any actual intention of getting the hot spiced shrimp. Just seemed like a place proud enough to give it such high billing would pair nicely with the smooth Yacht Rock music of the late ‘70s and early ‘80s. Man, did that ever turn out to be a good call. Much like Yacht Rock, Twin City Tavern is clearly of a time yet timeless all the same. You can’t call it retro, seeing as how it’s always been like this. Lots of wood paneling and fake bricks, and in certain areas of the bar you’re bathed in a classy red neon glow. There is no reason Twin City Tavern shouldn’t be the most happening nightspot on the marina, except of course for the fact that Kansas City is landlocked. With McHugh and Voytek joining us, we sat down and ordered some hot wings and the first of a few buckets of beers, which are $11 for five domestics. 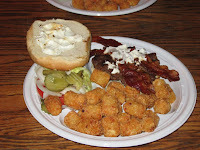 Shaw and I decided to split a couple of burgers for dinner, quickly settling on the Bacon & Philly Cream Cheese Burger. Because bacon plus cream cheese -- can it get more ‘70s than that? For burger number two, we asked the waitress what the most popular choice was and she pointed us to the Dutchburger, which involves Thousand Island dressing, grilled onions and swiss cheese. I also wanted to ask our waitress if her name was Brandy, but thought it best not to push my luck. 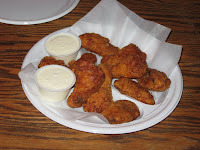 The hot wings arrived, and although they were unexpectedly sauceless, they still had a good heat on them. Nice and spicy and crispy. The Dutchburger was tasty enough, even if it was a little heavy on the dressing. Side-wise, we went tots, yet it’s worth noting that in addition to fries, Twin City Tavern has Fritos as an option. I can appreciate a place that serves Fritos instead of boring blah potato chips. I wasn’t truthfully expecting all that much out of the Bacon & Philly Cream Cheese Burger since I’m fairly lukewarm toward cream cheese, but it turned out to be like one of the best things ever. The generous schmear gave the burger a layer of melt-in-your-mouth creaminess that was even more intense what with the bacon in there -- and we’re taking bacon like bacon should be. Smoky, salty and thick. Not that wimpy bacon you find on so many burgers. 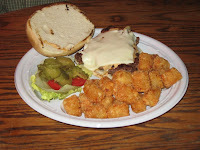 A big Lunch Blog thumbs up to Twin City Tavern. Next time, I think we’re going to have to give the hot spiced shrimp a shot. So how was Summer Breeze? Smooth, man, smooth. 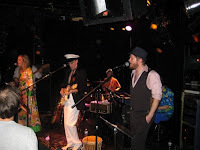 They absolutely nailed that Yacht Rock sound on favorites like “Steal Away,” “Rosanna,” and “Islands in the Stream.” J.D. Warnock did an uncanny Michael McDonald on “I Keep Forgetting” and “What a Fool Believes,” too. The show’s high point for me personally was when the first chorus of “Baby Come Back” kicked in -- it was one of my favorite soft rock moments come to life. Everybody at Record Bar was totally soaking up the good times. And never before have I seen so many captain’s hats. If you like smooth music -- and really, who doesn’t? -- mark your calendar now. Summer Breeze brings it to Record Bar again on Friday, June 26.